Washington is experiencing high levels of air pollution, forcing people to stay indoors and vacationers to cancel their trips. But it's not time to panic yet, UW physician says. It may be alarming to wake up to smoke-filled skies and see vast areas of Washington state covered in red on air-quality maps, but experts say while it’s good to be cautious, there’s no reason to panic yet. Agencies have been reporting different air quality ratings depending on whether they use national or state standards. Readings specific to Washington air quality standards, which are more protective of human health, can be found through the Department of Ecology. Cora Sack, a lung care physician at the University of Washington Medical Center, said that while the small particles in wildfire smoke can make their way into the lungs, the body will expel them. Sack does have good news for anyone looking for an excuse to skip their evening run, as she recommends limiting vigorous exercise outside for the next few days. But most people won’t experience long-term consequences from breathing in the smoke that’s around the region this summer, she said. “Most healthy people can go about normal activities,” Sack said. Washingtonians have been overwhelmed with smoky air for several days this month from wildfires raging in British Columbia to the north, Oregon and California to the south, and the eastern part of the state. 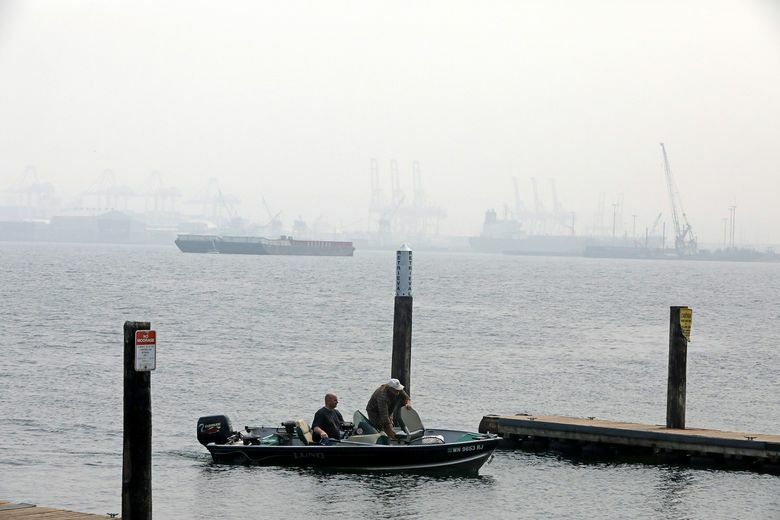 The haze is blanketing Western Washington the second year in a row, and some scientists predict that it will become more common in years ahead as warmer temperatures increase the size and frequency of wildfires. The smoke can exacerbate respiratory conditions like asthma and increase the risk of stroke and heart attacks for those with serious cardiovascular conditions, Sack said. For those sensitive to the smoke, she recommends taking precautions, such as limiting time spent outdoors. Overall, Sack said to listen to your body. If you can feel the health effects, such as eye irritation, severe coughing, chest pain or trouble breathing, go inside. The same goes for children: If they seem OK and the air quality isn’t hazardous, it’s probably fine for them to play outside. But if your child has respiratory conditions or the air quality in your region is extreme, Sack recommends trying to entice them with indoor activities. Monitoring stations in the Seattle region were reporting air-quality ratings ranging from moderate to very unhealthy on Monday, according to data from the Department of Ecology. The National Weather Service has issued an air-quality advisory through 5 p.m. Wednesday, while local authorities in King, Snohomish Pierce and Kitsap Counties advised residents to stay indoors. The Puget Sound Clean Air Agency issued a Stage 1 burn ban on Monday afternoon for King, Pierce and Snohomish counties. Among other measures, Stage 1 bans all outdoor burning, including wood and charcoal recreational fires. The smoke has caused delays at Seattle-Tacoma International Airport, according to the Federal Aviation Administration, which has kept planes farther apart in the air due to low visibility from the smoke, airport spokesperson Perry Cooper said. Travelers should check in with their airlines and sign up for flight alerts, which can be done on airline websites or through the Port of Seattle, Cooper said. In the Central Washington lake-resort town of Chelan, air quality fell into hazardous territory on Monday. At Campbell’s Resort, some vacationers canceled their reservations, even those who had been returning for decades, said Tom Campbell, the company’s president. Webcam footage on the hotel’s website, taken Monday afternoon, showed its normally crowded beach almost empty as a gray haze obscured views around the lake’s usually dark-blue waters. West of the Cascade Mountains, residents should expect to see smoke-filled skies until fresh ocean air enters the region Thursday, National Weather Service meteorologist Andy Haner said. Sack said increased air pollution is something to watch for, as chronic exposure to air pollution — particularly urban air pollution— is associated with negative health effects. Sack hopes discussion about pollution’s impact on health doesn’t fade away with the smoke. “If we can use this energy to make laws and policies to, longer-term, reduce exposure and maybe address some of the underlying problems for why we’re having these longer and more prolonged wildfire seasons, that would be a good outcome,” Sack said. Experts don’t know for sure what the effects of long-term exposure to wildfire smoke are, as most studies have focused on urban pollution, Sack said. Sack said it’s probably OK for people to put the masks away for now. Washington State University students were welcomed to their first day on campus with unhealthy air quality and free masks handed out by the Pullman Police Department. If you’re going to get a mask, Sack said N95 and N100 masks are the only ones shown to be effective, but only if they are worn correctly, which involves being fitted by a physician.